Published on August 23, 2014 in General T&T, People's Partnership, PNM and Politics. 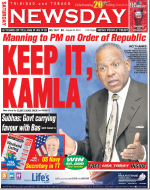 6 Comments Tags: Kamla Persad-Bissessar, Newsday, Patrick Manning, Politics, T&T Govt. FORMER Prime Minister Patrick Manning yesterday publicly declined the recommendation of his successor — Prime Minister Kamla Persad-Bissessar — that he receive the country’s highest honour, the Order of the Republic of Trinidad and Tobago, at this year’s National Awards Ceremony at Queen’s Hall, Port-of-Spain on Independence Day. During an Independence Day cocktail reception which she hosted at the Diplomatic Centre, St Ann’s on Thursday night, Persad-Bissessar announced she had recommended to President Anthony Carmona that former prime ministers Manning and Basdeo Panday receive the Order of the Republic. Panday, who is in Singapore, had not issued an official comment on the award up to press time. But Manning, in a statement issued by his constituency office, not only refused the award but hit out at Persad-Bissessar and her People’s Partnership (PP) Government saying she had led attacks against him in the 2010 general election campaign in which she defeated his People’s National Movement (PNM) administration which she did not withdraw in Thursday’s announcement. Confirming that Newsday called his son Brian for a comment on the nomination, Manning said, “I was neither consulted, nor advised prior to this announcement. I consider this approach a gross discourtesy.” Manning, who served as Prime Minister from December 17, 1991 to November 9, 1995 and December 24, 2007 to May 26, 2010, explained there was a well-established process for the selection of persons to be recipients of national awards. Opposition Leader and PNM political leader Dr Keith Rowley last evening expressed support for the position taken by Manning. “In her desperation to be liked and play politics with institutions, once again, the Prime Minister has taken advice and action which have served only to diminish and embarrass us all,” Rowley declared. Earlier PNM Public Relations Officer, Senator Faris Al-Rawi had said Rowley maintained the view that Manning and Panday stand as icons for their contributions to national development. “Once again, no respect for people and like most of her Government’s actions, no respect for process,” declared Rowley, who served as a Cabinet minister in all of Manning’s administrations, before being fired in 2008 when he questioned the lack of oversight for Udecott. However, standing up for Manning, Rowley agreed with his MP’s position on the Government’s management of the country. “Whether it is the Invaders Bay land, the Constitution amendments to change the election system or making an award, the arrogance of the Prime Minister sees her dismissing the need to follow proper process,” he said. Mr.Manning in the twilight of his long political career and national service albeit interrupted by an unfortunate cessation of blood to his brain made a fool of himself by concealing more than revealing about himself. How can a former Prime Minister and longest serving MP not know and appreciate the subtle and quite obvious distinction and separation between the party that is the UNC/PP and the Government; between political matters transacted in the cut and thrust of the electioneering hustings and matters of state involving the office of the President/PM on a most important national occasion? The “I” in Manning has clouded his judgment and his prepared statement is a sad reflection on his advisers/speech writers who wanted to throw dust in our faces by claiming that the PP won because they attacked the personal integrity of Mr.Manning. Mr.Manning on the cusp of his retirement from parliamentary politics is still being economical with the truth even though he had time to consider what he had to say to salvage his integrity and reputation. He should have rejected the medical assistance made available by the Government if he were to be taken seriously. Perhaps he was talking to his exclusionary PNM 28% and not all of T&T because he cannot appreciate the magnanimity of the inclusionary PM. This is a scandal and disgrace for every right thinking and respectful citizen of the Republic of Trinidad and Tobago. Our Prime Minister has now become a big fat joker. God save us please from this dumb party that is unfortunately ruling us. Manning refusal of the award is appropriate,but not because of any of the reasons which he publicly stated. He should never have been offered this award because of his failure as Prime Minister and his questionable, corrupt activities when in power. Was it not this same PP which threatened to prosecute him for crimes committed when in power? What more “stunt” is Kamla going to try to win an election when there is no performance whatsoever from her, her 20 dismissed Ministers or the rest of her cabinet or partnership in politics. All they seem to be good at is raising a scandal on the opposition benches. More importantly who are they really serving?